Synopsis: THE HUMAN RACE STARTED THE SIXTH MASS EXTINCTION ON EARTH. A chain of subglacial volcanoes erupt in Iceland. The melting ice floods the countryside. Poisonous gas descends on Scotland. A tsunami devastates the Norwegian coastline. An ash cloud rises into the atmosphere, blotting out the sun across Europe, ushering in a new Ice Age. Dozens of nuclear power plants, flooded by ocean water, experience meltdowns. Millions perish. Many more are displaced. All on the first day. On the second day, a series of earthquakes moving in a straight line, reveal the presence of something massive, walking across the landscape. Concealed by a thick, radioactive ash cloud, the 'aberration' heads west, toward Russia. Abraham Wright, a science writer for Modern Scientist, who wants nothing more than to be reunited with his family, finds himself at the center of the United States' response to the crisis. Under his new title as Assistant Science Advisor to the President, Wright is sent to Europe with a team of Army Rangers, where he uncovers the truth about the ancient behemoth laying waste to the world: there have been five mass extinctions on planet Earth, and the aberration has been present at each. On the third day, the world fights back. And loses. Separated from his family by continents and oceans ravaged by countless disasters and populated by strange new life, Wright struggles to survive in an evolving world. Hoping to uncover the key to mankind's redemption, he fights for answers, and to reach his loved ones-before the human race's extinction. THE APOCALYPSE MACHINE WILL FINISH IT. 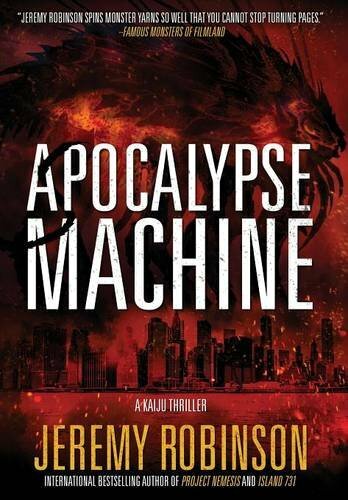 Jeremy Robinson returns to the Kaiju Thriller genre he popularized with the largest Kaiju to ever appear in fiction: the Apocalypse Machine. Bursting with all the epic action, desperate struggle and complex characters that readers have come to expect, Robinson takes the world to the brink once more, pitting humanity against the greatest threat he has yet to conjure, and asking the question: Does humanity deserve to inherit the Earth, or is our time up? About the Author&colon; Jeremy Robinson is the international bestselling author of over fifty novels and novellas including MirrorWorld, Uprising, Island 731, SecondWorld, the Jack Sigler thriller series, and Project Nemesis, the highest selling, original (non-licensed) kaiju novel of all time. He’s known for mixing elements of science, history and mythology, which has earned him the #1 spot in Science Fiction and Action-Adventure, and secured him as the top creature feature author. Robinson is also known as the bestselling horror writer, Jeremy Bishop, author of The Sentinel and the controversial novel, Torment. In 2015, he launched yet another pseudonym, Jeremiah Knight, for a bestselling post-apocalyptic Science Fiction series of novels. Robinson’s works have been translated into thirteen languages. His series of Jack Sigler / Chess Team thrillers, starting with Pulse, is in development as a film series, helmed by Jabbar Raisani, who earned an Emmy Award for his design work on HBO’s Game of Thrones. Robinson’s original kaiju character, Nemesis, is also being adapted into a comic book through publisher American Gothic Press in association with Famous Monsters of Filmland, with artwork and covers by renowned Godzilla artists Matt Frank and Bob Eggleton. Born in Beverly, MA, Robinson now lives in New Hampshire with his wife and three children. Visit Jeremy Robinson online at www.bewareofmonsters.com.